For student housing it has been the norm to use traditional marketing efforts such as Aprtments.com, billboards, student publications, and other old marketing avenues. In recent times, it has been apparent that the demographic of 18-25 years old students are not looking at any of those traditional sources, but looking on social media to find where their friends live or looking up reviews. Most properties have been directed to build up their Facebook platforms, while most of the demographic is missing the posts because they are too busy scrolling through their Instagram feeds and following trending hashtags on twitter. Social media is crucial for all housing communities to be marketing on, meaning if you’re not on it, you’re missing out! Let’s start understanding the top two reasons why we need to push our marketing efforts to social media instead of traditional ways of marketing. The first reason is simple, your current and prospective renters are there! This is become more of the norm for people to be constantly on their phones, reading the news on twitter, listening to their peers instead of paying attention to companies marketing campaigns. The second reason is pushing your social media efforts do not require a big budget, in fact it just requires a team that can give your platform enough attention it needs. Every brand can use social media to attract their customers and continue to engage them by being relatable community to them. Even though using social media is a no brainer, there are some common mistake you may be making that is steering your customers away. Student Housing is used to “gorilla marketing” and pushing specials into students eyesight. This has been holding back a lot of student housing brands to achieve the following and engagement on their social media platforms. It is hard for student housing to create a social media strategy that does not constantly “sell” their apartments by way (? )of ads like “price drop”, “waived fees”, etc. Instead of engaging your residents and prospects this is showing them that all you care about it is their money. Instead try to post relevant content that relates to your brand, community, university, and students life. Posts that relate to the student are going to see increased likes, comments, and engagement among followers. Another big offense in the social media community is to over post. This may seem harmless but your followers will quickly write you off and unfollow you for it. When users are looking through their timelines they want to see the diverse pages of everyone they follow. If they end up seeing more posts by one brand this will not allow them to see their friends’ posts and you will get kicked to the curb. To monitor this you can use dashboards such as Hootsuite, Tweetdeck, and more. These dashboards allow you schedule posts and allow you to see what you’re posting and when to help you avoid over posting. Social media users type a lot so they have brushed up on grammar and spelling skills. If your readers find a grammar/spelling error on your page be prepared to be called out. Improper use of “your” and you’re” is very common to irritate many followers and they have no shame in calling you out to all your followers. Lastly, spelling errors can make one comment change its entire purpose. Not only can it be bad for your marketing but it can be very embarrassing. Make sure you and multiple other people spellcheck all graphics and comments before posting to be safe. Avoiding these crimes is easy when following the simple rules of T.E.R.M. This acronym stands for trending, engaging, relevant and monitor. Below we will dig into each category to help explain how to properly engage your audience and win at social media marketing. To get noticed on any social media platform it is best to stick with trending topics. On Twitter and Instagram this is easily found using the magnifying or search icons to see popular topics that are being posted and popular hashtags that are being used. This should be checked every morning to see if your page can post something relating to that topic. Not every property, brand, company, etc. can relate to every trending topic and research should always be done before posting. You do not want to post something about your property having a #Aspen floorplan if that topic is trending because of a large crime or traumatic event. Instead always learn why the hashtag or topic is trending and then see if your brand can use it to launch your page. 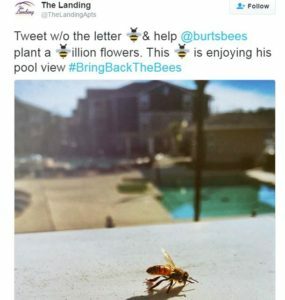 Below is an example of a property using #BringBackTheBees which was a hashtag by Burt’s Bee and it was all about saving bees. The property was able to find a photo on the property with a bee and use for the campaign. The property made sure to promote the pool view apartments but not in a “salesman” way. Engaging your users to comment or retweet your post is very important to your page. This will help your followers turn into brand ambassadors for free! Allowing them to tag their friends to win a prize and contests like this are great at building up your social media community. Even after you have a strong social media community continue to engage your followers with questions and posts that will intrigue them to take part. Below is a great example of a game on Instagram called “Freezetag”, in this game users will tag each other in the comments to win prizes. In student housing promotional collateral is a great way to play games like these since college students love free items and tagging a friend in a post is always worth it. Keeping in line with national trending topics is important as well as staying relevant to your specific demographic and market. Housing communities need to constantly be aware of what is going on in their neighborhood, city, Universities, etc. Keeping up to date on these topics will help your followers want to read your posts since it relates to their lives. Becoming more relatable also helps your brand become more likeable to your audience. It allows your followers to know you care and are involved within the greater community. Not only staying relevant in your community but keeping up with relevant topics among your demographic is important. College students especially have fun sayings or words that will gain popularity. Brands using these sayings or words are able to relate to their demographic of college students. This is a unique marketing tool that not everyone takes advantage of, use your employees to think of what is popular and turn into social media gold! 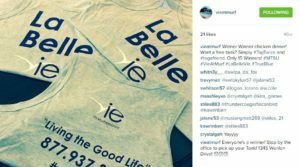 Below are three great examples of staying relevant whether it is promoting your University, supporting a good cause or charity, or posting with using the term Squad Goals to connect to your market. Now that you have posted trending, engaging, and relevant topics, it is time to monitor and watch your content. Monitoring is important after the post is up to make sure comments are being replied to in real time. The best part about social media is that it is so fast to interact with your audience and they can interact with you. Have a team or member in place to monitor the posted content, who will be in charge of replying and promoting the post itself. The other part of monitoring is to look back and analyze what gained results and what didn’t. This helps the team not continue to post about topics that are not engaging to the audience and help understand what is engaging and post more of that. After learning what not to do with social media and the easy to follow T.E.R.M method, you and your community are on the way to successful social media marketing. If you need more inspiration follow @VieMgmt and stay connected with us in all upcoming social media and marketing trends! ← Previous Previous post: Vie Management – making rental delinquencies a thing of the past!